When looking for the perfect diamond, most buyers begin by considering the 4 C’s: cut, colour, carat and clarity. Just as important is the actual physical form of the stone. A diamond’s shape can have a substantial effect on the overall look. Shape determines how light is reflected off its contours making each stone uniquely magnificent. 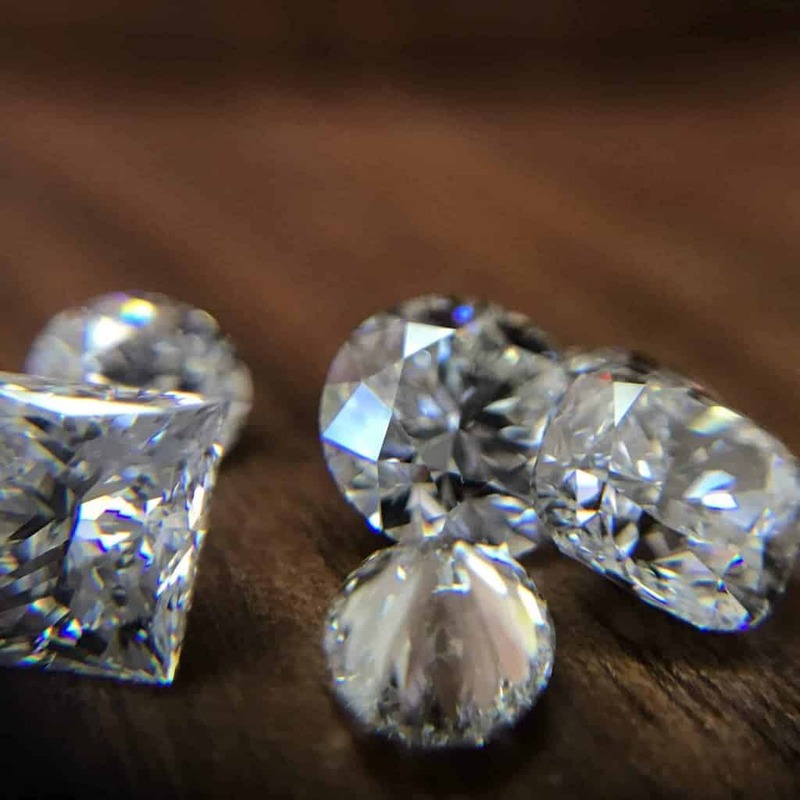 The shape can make the crystal sparkle with seemingly endless brilliance; or, it can be crafted in a way to lay most of the diamond bare, in order to appreciate the essence of the stone. The most popular diamond shape is the round brilliant cut. This cut resembles a cone and has been studied and improved upon by diamond cutters over centuries. This shape helps balance colour and clarity, giving the diamond a sparkling brilliance. It also features superb light refraction qualities; unmatched by other shapes. The round brilliant is the classic diamond shape most widely known and recognized. Introduced during the 1980’s, the princess cut is currently the second most popular diamond shape. These stones are square or rectangular with 90-degree corners. Princess cut diamonds that have been cut properly, will emit a huge amount of light; only out-classed by the round brilliant cut. The princess cut features sharp pointed edges, which need to be properly protected by the setting of the jewellery. If not, they will be susceptible to chipping. This is a beautiful shape that would go well with many styles of jewellery. A popular diamond shape is the emerald cut. This form is rectangular with a flat top accented by step-facet rows and beveled corners. The unique shape of the emerald cut makes the diamond somewhat transparent, requiring a stone with higher clarity and higher colour. This cut is elegant and transparent, as it lays most of the crystal bare for you to enjoy and study. This shape is striking and unique, making it a great choice for someone looking for something a little different. Like the emerald cut, the Asscher also has step-facet rows and beveled corners. The difference is that it is square rather than rectangular. Also, like the emerald, this shape allows diamond imperfections to be more apparent; therefore, a higher clarity stone is recommended. The Asscher cut was created by the Royal Asscher Company and is also referred to as a square emerald cut. The marquise cut resembles an oval with pointed ends. This elongated shape is set off by over 50 facets that allow light to sparkle throughout. The sharp points are prone to damage so special care should be taken to protect the diamond. The marquise diamond can make for a magnificent statement piece, such as a diamond pendant or engagement ring. The marquise has more aggressive pointed ends, which give them a lot of character and help differentiate them from other diamond cuts. An exquisite blend of the marquise and round cuts, the pear shape diamond resembles a teardrop with a rounded end tapering down to a single point. This shape can be cut from a wide range of stone widths, making it easy to customize. The pear shape has some many applications in jewellery and lends itself to many varying styles. This shape looks much like a furniture cushion with a rectangular or square shape set off with rounded corners and sides. Introduced during the 1800’s, the cushion cut shape has been displayed in many historical pieces, most notably the Hope Diamond. The cushion cut is either square or rectangular with soft edges. This shape lends itself very well to diamond halo engagement rings. A recent addition to the industry is the radiant cut. This shape blends the emerald and round cuts to produce a rectangle, square or near-square shape. With 70 facets, the radiant cut produces a striking luminance. The radiant cut is a very bold shape and can make for a stunning ring or pendant. Radiant cut diamonds are great for fancy colour diamonds as they seem to hold the colour of the diamonds very well. This classic shape takes the brilliance of the round cut and elongates it. This shape makes the diamond appear larger than other shapes of the same carat. The oval shape is easy to match with other pieces of jewellery and is a fan favourite the world over. Choose this shape and you will have endless possibilities at your fingertips. The oval tends to hold colour very well, for this reason we suggest going with a higher colour diamond of G colour or better. The heart shaped diamond is a popular choice for engagement and anniversary rings. One of the most difficult cuts, the heart shape is skillfully cut from the stone much like a pear shape only with two rounded edges tapering down to a single point. The heart is a symbol of love and can make for some very interesting pieces of jewellery. The shape of the diamond you select is a very personal choice. Make sure you take the needed time to look at a large variety of shapes in a large selection of jewellery. This will help you gauge your likes and dislikes. It will also help figure out the shape you know you would like to use as the centre piece and focus of your engagement ring, pendant or other jewellery purchase.